It’s 40 years since man first walked on the moon. 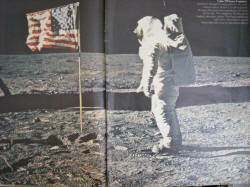 The Apollo progam achieved the goal of transforming human space travel from orbiting the earth to landing on the moon. 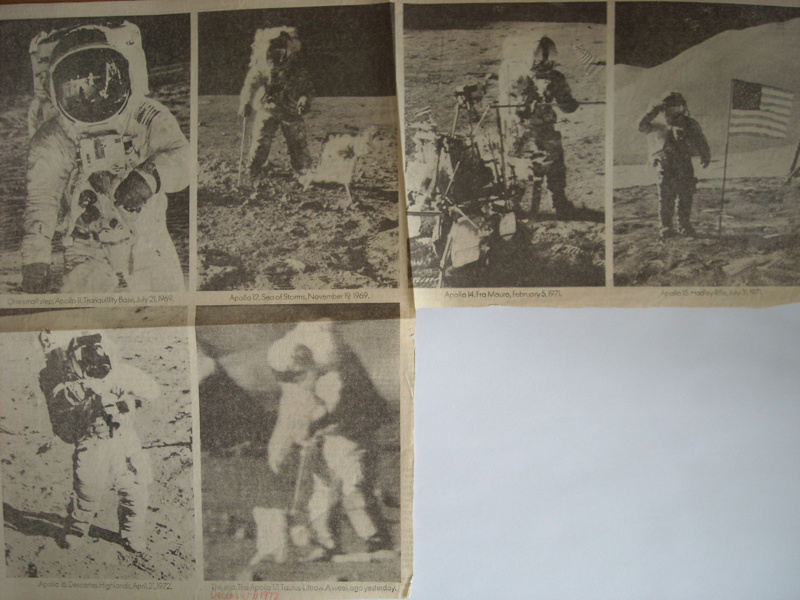 This article charts the progress of project Apollo from the perspective of my sellotape-bound scrapbooks. Being six years old when man first walked on the moon in July 1969, I was captivated by watching dreams turn into reality in front of my very own eyes. 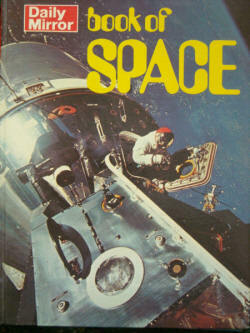 I was transfixed by the glorious colour photos of the moon, the earth, and the rockets that travelled between the two. Equally enthralling were the fuzzy TV pictures and crackly conversations between mission control on the ground and the astronauts in space. Every evening of every moon shot I would be woken from my sleep to watch the late night news followed by the moon specials hosted by the infectious James Burke on the BBC. These programs gave a wonderful insight into the drama of each mission. Video recorders and the internet – these were the science fiction of that age. 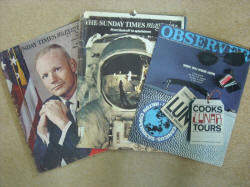 The only mementos for those on earth were newspaper cuttings and records. 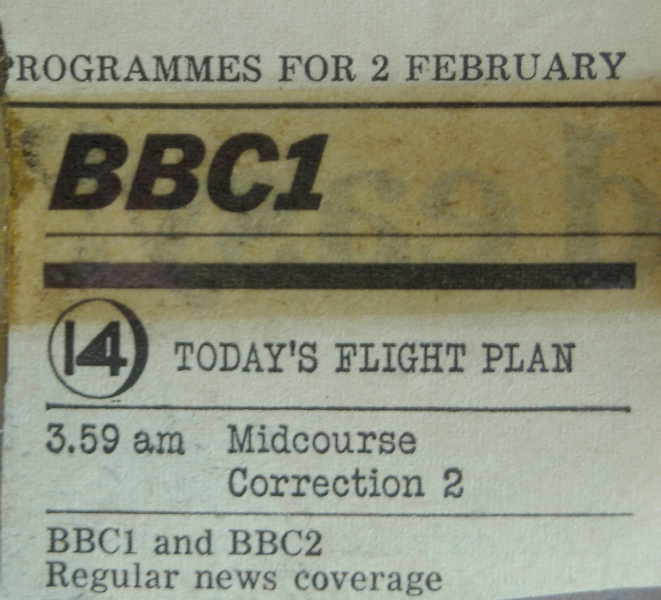 Fortunately the press and magazines of the time covered each mission in great detail, with the Radio Times noting minutiae such as mid-course corrections that took place in the middle of the night. The detail in the reporting was incredible by today’s standards – the public was expected to know and understand exactly how humans got from the earth to the moon and back again. Nowadays the average person wouldn’t even remember that there was a third man who didn’t even walk on the moon. Worse still in the 21st century all the talk seems to be about faked photos – well it’s true – Buzz Aldrin did not wear an Omega watch on the outside of his space suit. But the flag did not flutter in the breeze - it had a wire stuck along the top of it so it appeared to be flying as if on earth. Most people only owned black and white televisions so the colour images in books and magazines were all the more powerful. As the Apollo program unfolded each journey became bolder and corresponding TV coverage became better especially with the advent of colour images. 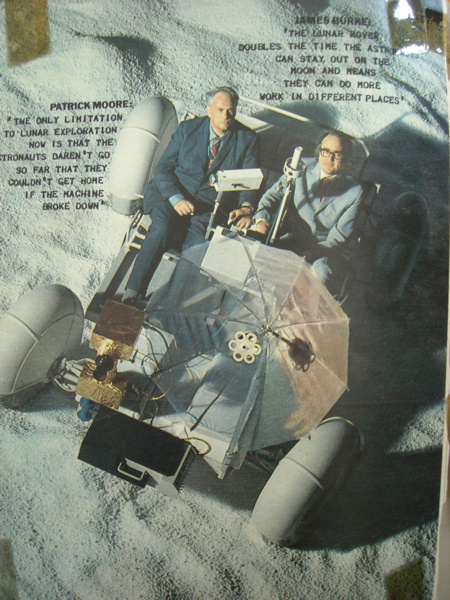 The later missions used the lunar buggy which allowed astronauts to explore a much larger area and conduct more scientific experiments. However all the iconic images from the surface of the moon could not be published until the cameras that taken them were safely returned to earth. 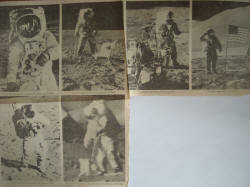 During each moon walk the newspapers could only publish still images from TV screens. Blurred images or not, the reporting was vital particularly when Apollo 13 ran into trouble and the rescue options had to be explained to the concerned masses. That they made it home safely is a testament to the ingenuity and team spirit of the NASA teams involved. This mission and Apollo 11, the first to land on the moon, will be forever remembered in folklore. There were actually five other lunar modules that touched down on the moon, and even in December 1972 as the final Apollo journey was concluding, questions were being asked about the program’s worth. I missed the final splashdown as I had my Primary 7 Christmas party to attend. My mother assured me that they would soon be back on the moon. Today nearly 40 years later I’m still waiting. 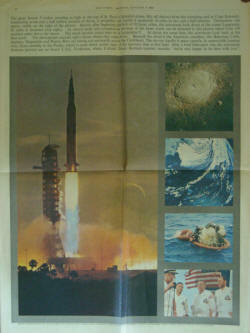 Apollo 8, The Times colour supplement (very unusual for that time), January 1969. I took this in to my class in Primary 2, and it was on the wall till Easter. I fished it out of the bin as bafflingly (to me) the teacher did not give it back to me. Apollo 11, Sunday Times magazine, July 1969. This is one of the famous photos of Buzz Aldrin saluting the American flag. There is widely available time elapsed film from the colour still camera in the Lunar Module that shows how the flag was erected including the infamous wire along the top. It even shows the moment this photo was taken. 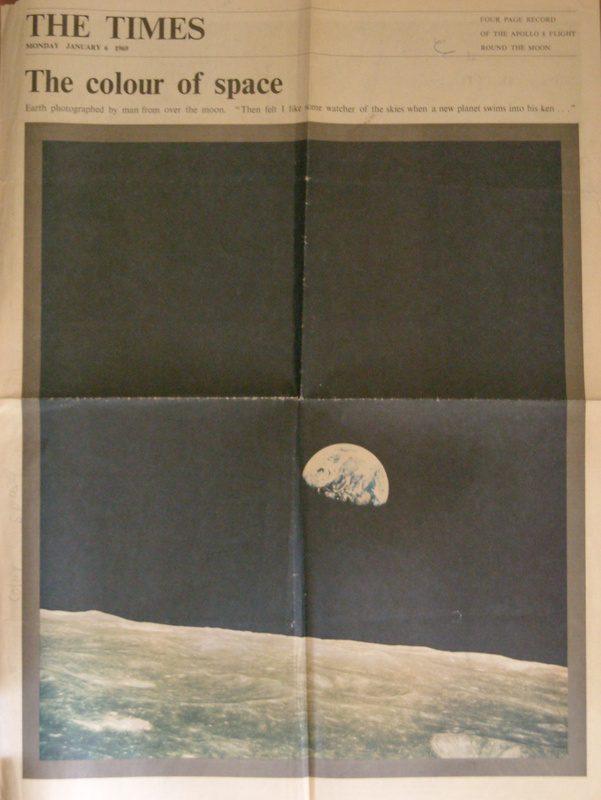 Apollo 11, contemporary newspaper advert, 1969. 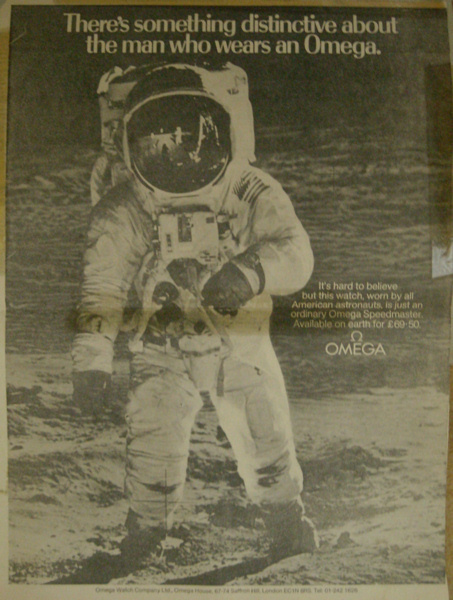 To this day Omega advertise that only their watches were worn on the moon. However Buzz Aldrin did not wear it on the outside of his spacesuit. Apollo 14, The Times, February 1971. This was the mission where the on board computer on the Lunar Module was re-programmed during the descent to the surface to prevent an abort alarm. Alan Shepard became the oldest person to walk on the moon and celebrated by playing some golf. 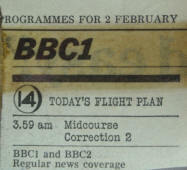 Apollo 14, Radio Times, February 1971. 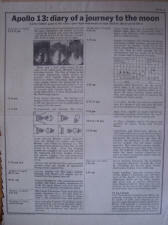 The Radio Times was brimming full of information about every mission event regardless of whether there was a broadcast associated with it or not. Apollo 16, Radio Times, April 1972. It is not clear how many of the public would have known the difference between "miles" and "nautical miles" or understood what "yaw" meant. Note also that 7.08pm was represented as 7.8pm in those days. 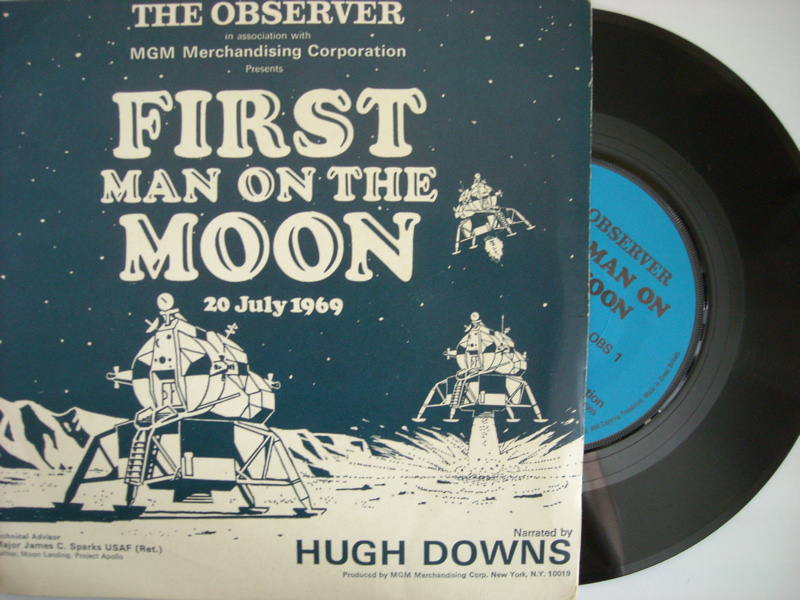 Apollo 11, Observer single, July 1969. The only non-written way of re-living the moon landing. No cassettes, no video, no DVD, no Internet in 1969. Apollo 13, The Times, April 1970. 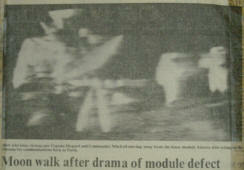 The headline is part of a two page article explaining how the Apollo 13 rescue would work. 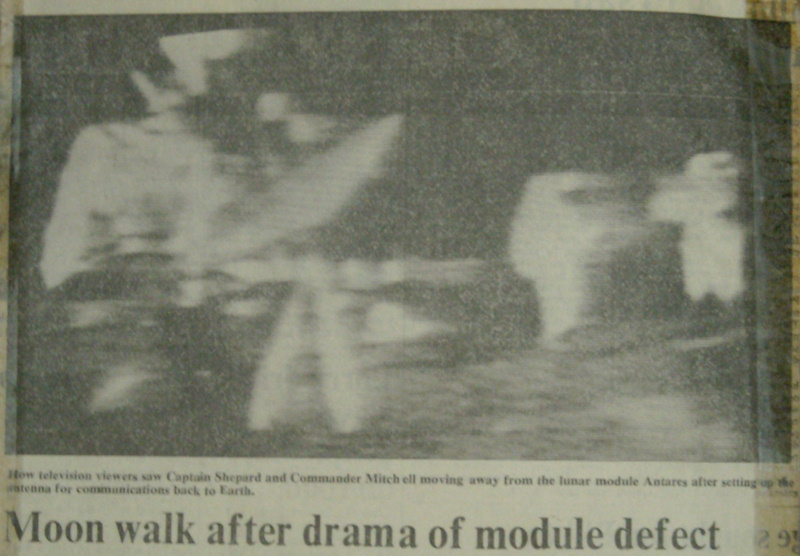 Apollo 15, The Times, August 1970. 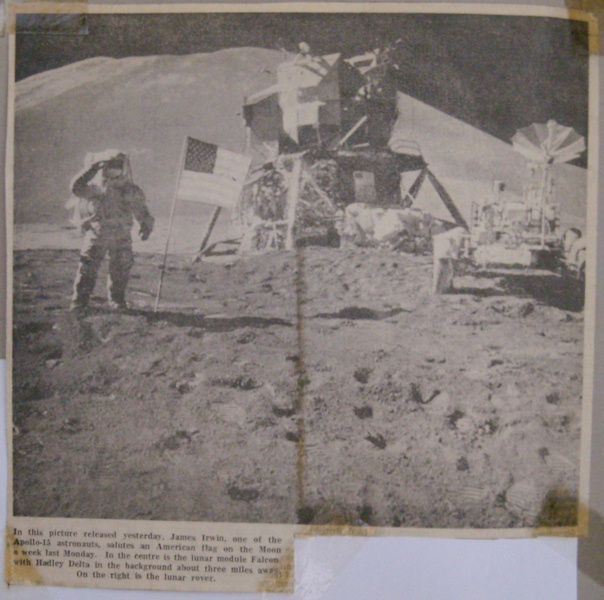 Yet another iconic photograph from the moon - this time it's of James Irwin saluting (again) the flag. See the colour version here. This mission was probably the most spectacular as the landing site was in Hadley Rille. It had mountains, craters, rocks and all with a colour TV camera for the first time. See this photo being set up from the perspective of the lunar rover here. 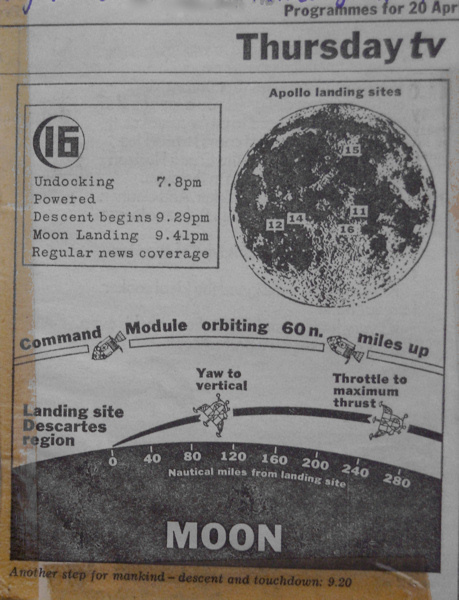 Apollo summary, The Times, December 1972. This is a summary of all the missions to land on the moon. Even before the final Apollo was complete, people were asking if it had all been worth it. Apollo 17, Radio Times, December 1972. The final mission - blasting off on prime time TV in the US, but the middle of the night in the UK. 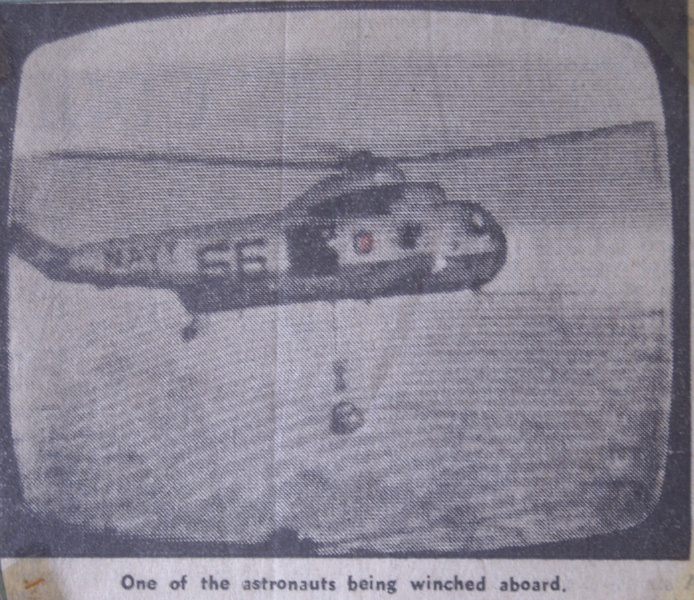 Apollo 9, The Glasgow Herald, March 1969. All Apollo missions splashed down in the Pacific Ocean. The crew were picked up by Navy helicopters and returned to a nearby aircraft carrier. 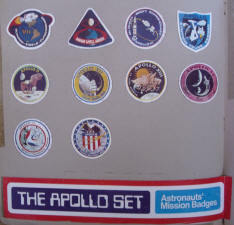 Apollo badges. 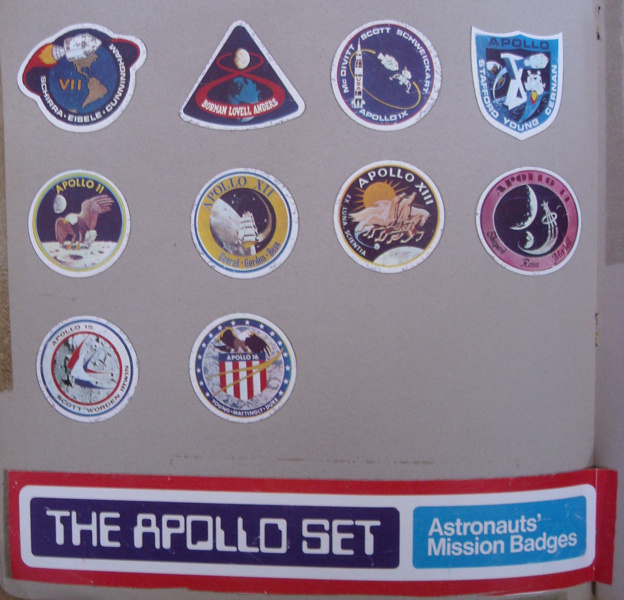 Every Apollo mission had an associated badge which the crew wore on the space suits. The Apollo 17 badge is missing here as it had yet to fly. Much of the moon memorabilia and books were published before Apollo 17 to capitalise on the interest before the final mission had flown. 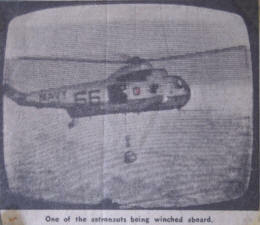 Apollo 13, Radio Times, April 1970. This is the original mission plan, showing how and when Apollo 13 would land on the moon. 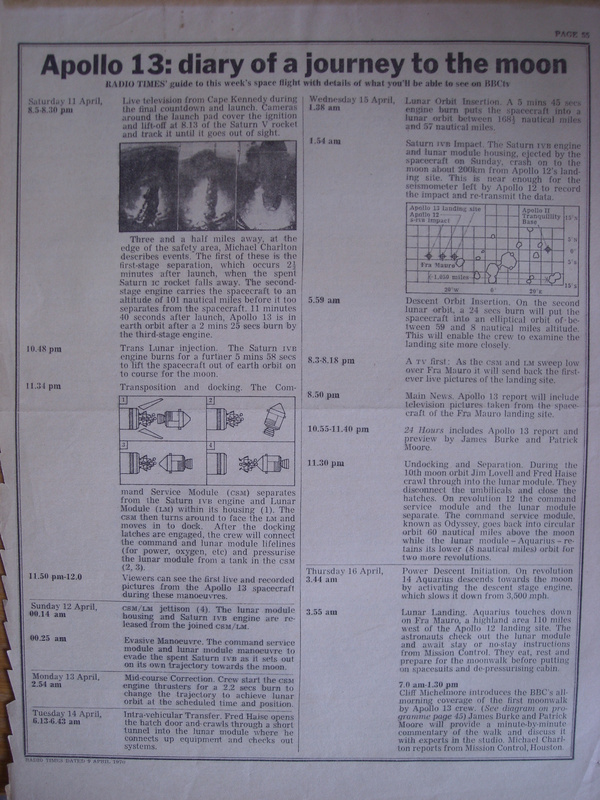 The explosion that caused the mission to be aborted occurred two days after blast off so the plan completely changed after the entry for Monday 13 April. Apollo 15, Radio Times, July 1970. James Burke and Patrick Moore were the stalwarts of the BBC moon specials. Burke, a true enthusiast, and Moore, a true astronomer brought the whole show to life. They are seen here sitting in the lunar rover (or lunar buggy) which Apollo 15 took to the moon for the first time.